You will be made to feel welcome the moment you walk in the door. Asheville Chiropractor, Dr. Terri Lechner wants all of our patients to immediately feel at home when they walk in the door. Since chiropractic care involves a series of visits, with each one building on the ones before, it’s important for you to feel comfortable right from the start. Your first visit in our Asheville chiropractic office we will ask you questions, do a complete orthopedic neurological exam and take x-rays if necessary. This helps us determine if we can help you and also gives us an estimate of how long it will take us to help you. 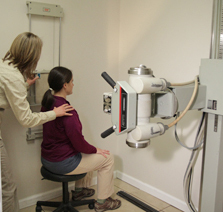 Your condition may also require X-rays which can be taken at our office. Your health history helps us pinpoint the problem instead of focusing on the symptom. After reviewing your health history, we will then give you an assessment of your condition and answer any questions you have. Next we perform an exam of your spine, posture and body alignment. Your condition may also require X-rays which can be taken at our office. Save time during your first visit by completing your paperwork ahead of time. Depending on the severity of your condition and if time allows, we will find which areas of your body are out of alignment, this is called a subluxation, and then perform your first chiropractic adjustment at our office. We employ several techniques and will use which one we feel will give you the best results. You can expect your first visit in our office to be about one hour. If you truly want to achieve a higher quality of life without having to rely on over-the-counter drugs and prescribed medications then contact Asheville Pain and Wellness Center so we can offer a natural solution! Take a look at what you can expect during your next visits.